“The Secret Doctrine”, by Helena P. Blavatsky. Every planet has geographical poles. If, like the earth, a body generates a magnetic field, it will also possess magnetic poles. The two geographical poles of our earth are the North Pole and South Pole. The North Pole, also known as Geographical or Terrestrial North Pole, is defined as the point in the Northern Hemisphere of the earth, where the earth’s axis of rotation meets its surface. It is lying diametrically opposite to the South Pole. It lies 90 degrees north from the earth’s equator. The geographical north pole is also known as the “true north.” This is a spot in the Arctic Ocean where all lines of longitude converge. Likewise, the Geographical South Pole of our earth is the southernmost point where the earth’s axis of rotation meets its surface, being 90 degrees south from the earth’s equator. The North Pole is located in the middle of the Arctic Ocean, amid waters that are almost permanently covered with constantly shifting sea ice. The South Pole lies on a continental land mass. Thus, the Geographical North and South poles are places on the earth’s surface through which the earth’s imaginary spin axis passes. Sunrise at the North Pole is just before the March 21st or the time of Vernal Equinox, after which the sun takes three months to reach its highest point of elevation at the summer solstice or on June 21st. After that the sun begins to sink, so that there is sunset, when the sun sinks below the horizon after the autumnal equinox or on September 23rd. Thus, at the North Pole the sun is continuously above the horizon during the summer, and continuously below the horizon during the winter. Likewise, during the period, March to September, the South Pole receives no sunlight. Although between September to March the sun is continuously above the horizon, much of the sunlight that reaches its surface is reflected by the white snow. This lack of warmth from the sun, combined with high altitude means that the South Pole has one of the coldest climates on earth. Thus, the region of the South Pole has been described as being cold and dark. It has six months of complete daylight and six months of total darkness each year. According to the Hindu tradition, Meru, the sacred mountain is placed in the centre of seven continents. The Theosophical Glossary says that Meru is the name of the mountain that is supposed to be in the centre of the earth, which is the abode of the gods, swarga or heaven. The occult teachings place it in the very centre of the North Pole. The nether region or Patala was supposed to lie in the South. Thus, the North and the South Pole were regarded as “Mountain” and “Pit” or Heaven and Hell respectively. The Polar Regions surrounding the North and South Poles are respectively, the Arctic and the Antarctic regions. H.P.B. explains that since the ancients knew too well the topography and geography of these two regions, they named one of the poles as “Mountain” and the other as “Pit”. One of the reasons why the North Pole is called the abode of the gods is that it was the site of the first continent on our earth, after the solidification of the globe. The first continent on our earth is called the “Imperishable Sacred Land”. As the name suggests the first continent or island, which is “the cap of the North Pole”, has never perished; nor will it perish to the end of the Seven Races (S.D., vol. II, p. 372). It is stated that “it is the only one whose destiny it is to last from the beginning to the end of the Manvantara throughout each Round. It is the cradle of the first man and the dwelling of the last divine mortal, chosen as Sishta for the future seed of humanity.” Of this mysterious and sacred land very little can be said, except that the “pole-star has its watchful eye upon it, from the dawn to the close of the twilight of ‘a day’ of the GREAT BREATH” (S.D., vol. II, p. 6). The “Day” refers to the Day of Brahma, which equals fourteen manvantaras. Thus, it appears that this continent, which is at the North Pole, will last till the evolution on the earth chain of globes is completed, and will be the dwelling of the divine mortals, the Buddhas and Christs, of the seventh Round and the Seventh Race. 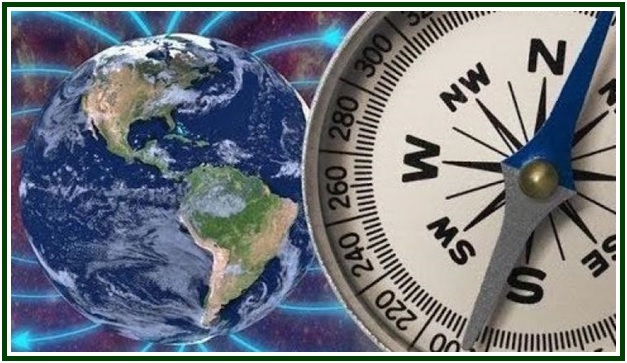 In the article “Where is the North Pole?”, that appeared in “Theosophy” magazine (April 1926), we read that H. P. Blavatsky meant something else by the “North Pole” than the present geographic pole. It is indicated that the unknown land was the polar continent at the time of the first race humanity of the Fourth Round. However, as per the Theosophical doctrines, since the poles of the earth are continually perambulating it is not possible that the polar land of that day should be at the present pole. Besides geographical poles our earth has magnetic poles because according to science, our earth has a magnetic field produced by the swirling motion of molten metal in the earth’s outer core. It is also due to electric currents flowing in the earth’s crust and atmosphere. Since these motions are changing all the time, the magnetic field is also changing, causing the movement of the magnetic poles. The movement is also ascribed to electric currents flowing in the ionosphere, and the earth’s magnetosphere. The movement of geographical north and south poles is ascribed to changes in the inclination of the axis of the earth. We have several statements in the Secret Doctrine indicating the shifting of the poles. Thus: “The Egyptian priests assured Herodotus that the Pole of the Earth and the Pole of the Ecliptic had formerly coincided” (S.D., vol. II, p. 332). “That even since their first Zodiacal records were commenced, the Poles have been three times within the plane of the Ecliptic, as the Initiates taught” (S.D., vol. II, p. 368). “Occult data show that even since the time of the regular establishment of the Zodiacal calculations in Egypt, the poles have been thrice inverted” (S.D., vol. II, p. 353). Further, due to axial inversion and the shifting of the poles, at certain periods of time the tropical climate and vegetation was found at the poles. On page 145 (S.D., vol. I) we are told that the seven Sons of Fohat are also his brothers, and that these seven “Sons-brothers” are seven forms of Cosmic magnetism, and they are called “Seven Radicals” in practical Occultism. It is these seven radicals which produce seven energies, namely, Electricity, Magnetism, Sound, Heat, Light, Cohesion, etc. and they are called progeny of the Sons of Fohat. H.P.B. explains that Fohat is the symbol of universal, unpolarized electricity, whereas his sons are 7 radicals of electro-magnetism, which are polarized forces. There are five major circles of latitude. The Equator; then in the northern hemisphere at 23 ½ degree latitude is the tropic of Capricorn; then at 66 ½ degree latitude is the polar circle of Arctic. Likewise, in the southern hemisphere, at 23 ½ degree latitude from the equator, there is the tropic of Cancer, and at 66 ½ degree latitude is the polar circle of Antarctic. H.P.B. refers to four circles: the Equator, which is a circle passing through the middle of the earth, and divides the earth into northern and southern hemispheres. The second circle is the ecliptic. The last two circles are the tropics of Capricorn and Cancer. Ecliptic is the imaginary line which marks the path of the sun, and along which lie 27 constellations divided into 12 zodiac signs. The four Sons of Fohat are placed in these four circles. They are being described as electro-positive. These four circles must be covering regions with strong electro-magnetic currents and therefore they are presided over by Sons of Fohat which represent cosmic magnetism. Magnetism being a force with polarity, we are told about electro-positive sons presiding over these regions. These are intelligent forces and therefore, probably, represented as mystical entities, and are shown to regulate and preside over the climates. What are the seven hot and seven cold lokas? We are told that the other seven Sons of Fohat preside over seven hot and seven cold lokas and these are seven heavens and hells of the Hindus, and they are taken to be situated at the two ends of the Egg of Matter, i.e., at the two poles of the earth. These refer to polar circles referred to above. While the westerners speak of only two polar circles, namely, Arctic and Antarctic; the Hindus speak of seven circles at each pole, being referred to as seven hot and seven cold lokas. These are also referred to as seven silver and seven golden steps leading to Mount Meru which is the North Pole. In the Secret Doctrine Commentaries we read that the region between the Arctic Circle and the North Pole consists of 28 degrees which they divided into seven circles that are four degrees apart from each other. These are seven hot lokas or golden steps to Meru. Likewise, the region between the Antarctic Circle and the South Pole consists of 28 degrees and is divided into seven circles that are four degrees apart from each other. These are seven cold lokas and seven silver steps. The North and South magnetic poles are said to be the storehouses, receptacles and liberators at the same time, of Cosmic and terrestrial electricity. The Northern and Southern lights Aurora Borealis and Australis are owing to these magnetic and electric forces. The two poles are called storehouses and also natural “safety valves”. In the Secret Doctrine (vol. II, pp. 400-404), we are told that mount Meru is not “the fabulous mountain in the navel or centre of the earth”, but its roots and foundations are in that navel, though it is in the far north itself. The North Pole is called the country of “Meru”. “Occult teaching corroborates the popular tradition which asserts the existence of a fountain of life in the bowels of the earth and in the North Pole. It is the blood of the earth, the electro-magnetic current, which circulates through all the arteries; and which is said to be found stored in the ‘navel’ of the earth.” Thus, it appears that the centre of the earth and the North Pole are both regarded as the fountains of electrical and magnetic currents. Particles discharged from the sun travel towards the earth and are drawn irresistibly towards the magnetic North and South Poles. As these particles pass through the Earth’s magnetic field they mingle with atoms and molecules of oxygen, nitrogen and other elements and that results in the display of lights of various colours in the sky. The lights at the North Pole are called Aurora Borealis and at the South Pole are called Aurora Australis. The two poles may be said to receive and store the cosmic and terrestrial Vitality both from the centre of the earth as also from the Sun. When there is surplus of vitality, it remains stored in these poles and if these were not there our earth would be destroyed, and hence they are called safety valves. The above text was published in our associated websites on 21 August 2018. Click to see the article “Human Ethics and Earthquakes”, by Damodar K. Mavalankar. Read the texts “The Causes of Glaciation”, by John Garrigues; “Direful Prophecies”, by William Q. Judge; “Al Gore, Theosophy and the Cycle”, by Carlos Cardoso Aveline; and “Climate Change in Ancient Times”, by Helena P. Blavatsky.